At this time of the year, we often find the motivation we need to get on the “right track” with our health. Perhaps it’s engrained in us from years of starting a new school year every September. Much like New Years and the first day of Spring, we have a strong desire and high motivation to get well. But when the stresses of day-to-day life take over, we usually default to our less healthy habits. For this reason, my number one recommendation to maintain your health goals is to plan. When we take the time to plan we are in fact prioritizing our health, and carving out the necessary time it takes to make wellness happen. By doing this, we can avoid a lot of the pitfalls that occur when unexpected life events arise that are often what get us off course. takes the thinking out of shopping (which frees up some mental energy) and gives us the focus we need to stick to the healthy items instead of randomly throwing things into the cart. It also helps us avoid eating on the run, which can often lead to trips through drive thrus and quick stops at coffee shops. By writing a meal plan, we can deliberately choose the foods that will help us achieve our wellness goals. Prep your meals and snacks for the week ahead: After your grocery shop, look at your meal plan and see which foods can be planned ahead of time. This helps to make eating well during the week a breeze. For example, you could cook up some beans and grains (such as quinoa or rice) that will keep well in the fridge, pack a mason jar of raw nuts and dried fruit to keep in the car or desk at work, and wash and cut up veggie sticks to munch on in between meals. The benefits of prepping meals is most evident when life throws us curveballs and we tend to pick the quickest, most convenient foods to get us through those moments. Those foods tend to be unhealthy and unsupportive of our health goals. By prepping our meals, we are making it easier to pick healthy options during moments of weakness. 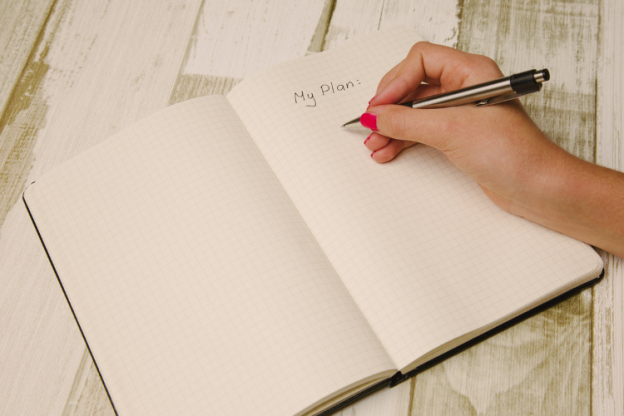 Plan and prep the night before: Along with planning and prepping for the week ahead, I recommend doing it nightly as well to make every next day a success. For example, if I don’t put my daily supplements in my pillbox the night before, I won’t end up taking them the following day. Ever. Therefore, I try to be conscientious to fill my pillbox the night before. The same is true for meals. If you can prepare your breakfast and lunch from the night before (and perhaps a marinade or slow cooker meal for dinner), it will be much easier to succeed at sticking to the healthful meal plan you made for yourself. Plan for the unexpected: As stated above, our health goals are hardest to maintain when the unexpected happens. Therefore, keep healthy snacks on hand at all times, and also keep a list of healthy options that you can refer to when you’re on the run, stressed, and tempted to default to unhealthy habits. Some ideas to consider are: checking out the deli section at the nearest grocery store, finding a smoothie and salad bar instead of fast food, or ordering a salad and sashimi at the closest sushi restaurant. As always, getting a good night’s sleep is the foundation to any health plan – including a nutritional one. A tired mine craves sugar. So plan, prep and get to bed on time! To help you get started, click here for my healthy grocery list that you can print as needed!